The boss of a Turkish shipyard has said an accident during a lifeboat test that killed three workers had saved 19 lives. Mehmet Oyar, founder and chief executive of the Gisan shipyard, told Turkish media the fatal accident, caused by a cable snapping, had prevented it happening during an emergency at sea, with 19 the lifeboat"s capacity. Oyar also dismissed suggestions sandbags could have been used instead of people, saying it was normal to use workers. 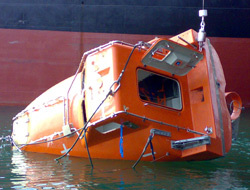 Twelve other workers were injured when the Chinese-made lifeboat crashed into the water in the incident on 11 August. The lifeboat had been installed on the 21,500-dwt Turquise T belonging to Galata Shipping, Turkish sources say. The Gisan shipyard, sited in Istanbul"s Tuzla industrial complex, was closed after the accident but re-opened two days later. The incident lead to fresh protests this week in Istanbul at Tuzla"s safety record and came two weeks after a shipyard worker was fatally injured in an explosion at the Gemsan shipyard. The Turkish government has reacted to the recent spate of accidents in which dozens have died by ordering some yards to close temporarily and investigating working practices, with the heavy use of subcontractors the focus of attention. The Gisan incident also revives concerns about the reliability of lifeboat-launch systems. Fatal accidents during lifeboat tests worldwide are thought to number in the hundreds over the last 20 years, with fierce controversy over who should bear the responsibility. Several lawsuits have been taken out against both shipowners and lifeboat manufacturers, but last month BP Shipping dropped its legal action against davit-maker Hatecke of Germany, brought over a 2004 accident on the Isle of Man-flagged, 37,333-dwt product tanker Baltic Champion.